BOSTON, MA, MARCH 19, 2018 – Cogent, Zayo, GTT and Sprint have achieved a position on the 2017 U.S. Competitive Provider Ethernet LEADERBOARD, according to Vertical Systems Group’s latest research. The Competitive Provider LEADERBOARD, which ranks companies in order based on U.S. retail Ethernet port share for this segment, is an industry benchmark for measuring Ethernet market presence. To qualify for the 2017 U.S. Competitive Provider Ethernet LEADERBOARD, companies must achieve either a top rank or a Challenge Tier citation on the 2017 U.S. Carrier Ethernet LEADERBOARD. Competitive Provider is one of three U.S. provider segments, along with the Incumbent Carrier and Cable MSO segments. Cogent advances to first position on the 2017 U.S. Competitive Provider Ethernet LEADERBOARD, moving up due to the exits of Level 3 (merger with CenturyLink) and XO (acquired by Verizon), which respectively held the first and second positions in 2016. Also as a result, Zayo moves up to second from fourth position, and Sprint moves up to fourth from fifth position. GTT solidly attains third position for its initial entry to the Competitive Provider benchmark ranking. 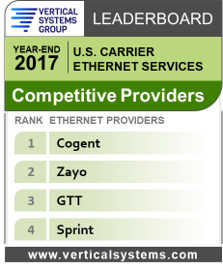 Each of these top four competitive providers has a Challenge Tier citation on the 2017 U.S. Carrier Ethernet LEADERBOARD. (For the first time, no Competitive Providers qualified for a LEADERBOARD rank.) Hundreds of CLECs, local and regional providers, global and specialized carriers that operate fiber-based networks or utilize third-party network facilities compete in the U.S. Ethernet services market. Other companies in the Competitive Provider segment include the following (in alphabetical order): Alpheus Communications, American Telesis, Birch Communications, BT Global Services, Consolidated Communications, Crowne Castle Fiber, Expedient, FiberLight, FirstLight, Great Plains Communications, Logix Fiber Networks, LS Networks, Lumos Networks, Masergy, MegaPath, NTT America, Orange Business, Tata, Telstra, TPx Communications, Unite Private Networks, US Signal and other competitive providers selling retail Ethernet services in the U.S. Detailed Ethernet share results that power the Year-End 2017 U.S. Ethernet Segment LEADERBOARDs are available now exclusively through Vertical Systems Group’s ENS Research Programs. For more information Contact us.